CD reviews: "This Must Be Heaven," "Stay Awhile," "Quality Time" and "Live At the Berks Jazz Fest"
These reviews first appeared in the February 6, 1999 edition of the American Reporter. Kenny G has caused a lot of confusion, sparked many an argument and made a ton of money, to boot. Just what is jazz, and what is pop instrumental? And (from those who don't take such esoterica quite so seriously) does it matter? Of course, he wasn't the only one practicing a light, jazz-tinged feel-good brand of music in the 1980s and '90s: Fattburger, George Benson, Spyro Gyra, the Yellowjackets, Hiroshima. The "Lights-Out Jazz" style scored strongly with young suburbanites looking more for relaxation at the end of a hard day than enlightenment or artistry  much as many of their parents had turned to Herb Alpert twenty years earlier. Four recent releases mine much the same territory as Kenny G, and call forth the same question: Jazz or easy listening? Saxophonist Don Diego doesn't seem to make any pretenses about jazz aspirations. He seems content to let others label his music and simply play a radio-friendly brand of instrumental music. His new album is a huge step forward from his 1997 debut: Lusher, smoother, with seamless playing on his alto and soprano saxes. The music is bright, upbeat  what an ad exec might call "sunny." Diego and band are joined on one cut by singer Whitney Marsalis, who lends a steamy, sultry tone. Steve Cole is similarly focused  and pleasing. His debut is on the Bluemoon/Mesa imprint of Atlantic, which started out life as an independent label specializing in light pop-jazz (their biggest act while still independent was the world-beat duo Willie & Lobo). While he, too, will play tenor and alto saxes, he plays tenor more often, giving his music an earthier sound than Diego's. Mixing the pop-jazz sounds of Bob James or George Benson with an R&B flavor and an uptempo beat, Cole has created a sound both immediately accessible and still recognizable individual  not an easy task. His saxophone playing is marked by a distinctive use of rhythm, kind of a sing-song effect that works pretty nicely. The arrangements are breezy, marked by a plush background and tasteful use of vocal effects. Again, nothing heavy  just nice, pleasant dinner music. 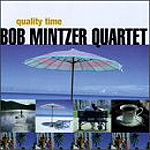 Bob Mintzer is more troubling for those who consider themselves jazz purists. As saxophonist for the immensely popular Yellow Jackets, Mintzer has cheerfully and productively mined the light-jazz vein for years. Somewhere between the accessible fusion of Weather Report (respectable in the eyes of jazz fans) and the more commercial (and thus suspect) pop-jazz of George Benson, the Yellowjackets are seen as being on the fringe of the jazz world. Some of what they play is real jazz (i.e., spontaneous, improvised solos) and others not (playing memorized solos). Mintzer's latest project likewise straddles the two worlds. Joined by world-class drummer Peter Erskine, Mintzer and his combo run through an hour of music that is probably too pop for jazz fans, too jazz for pop fans. It is darker than what listeners of the Yellowjackets are going to be used to; more interesting, for that matter. At the same time, it never really delves into anything heavy or particularly exploratory (is that really Erskine on this album?). The end result is a recording that seems to not have a particular goal: It's nice enough, but not very fulfilling. 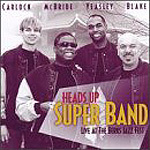 The members of the Heads Up Super Band aren't exactly household names: keyboardist Joe McBride, saxophonist Kenny Blake, drummer Keith Carlock and bassist Gerald Veasley (who does have some name recognition from his stints with Grover Washington Jr. and Joe Zawinul). Heads Up touts this album as being of the "Smooth Jazz" variety, so any pretense of high-brow art is quickly out of the way here, too. Recorded live in Reading, Pa., this CD is even more R&B-oriented than the Diego or Cole discs  these guys could back Chaka Khan in a pinch. What they don't have is a strong enough set of songs to either show off their impressive chops or hold your interest. They do lay down a tight cover of Hall & Oates' "Smile Sarah," though, with McBride's rich, throaty vocals especially memorable. But the rest of the album doesn't hold up well against that cut in comparison. If you have a PC or Mac with an "Enhanced CD" compatible CD-ROM drive, you can view very high quality videos from the same concert as the CD  with different songs than those on the audio tracks. If you dig these guys, that's a pretty good bargain for the price.